Private transfer to Reykjavik. 2 nights stay in a superior hotel in Iceland’s capital. Welcome drink & gourmet dinner at a nearby restaurant. We explore the Reykjanes Peninsula with its hot springs, mountains, bird cliffs, lunar landscapes and fishing villages. Krýsuvík is an area with solfataras, fumaroles, mud pots and hot springs. The soil is coloured bright yellow, red and green. In the afternoon we warm up in the geothermal mineral-rich waters of the famous Blue Lagoon. Once we reach Reykjavík, we show the highlights of Iceland’s capital and visit the Pearl, enjoy the panoramic view from the observation deck and walk through a man-made ice cave in the middle of the city. Included choice of activities: Whale watching from Reykjavik or hiking on the Reyjanes Peninsula or horseback riding or lava caving. We start the morning with a short introduction to Icelandic geology while watching a striking film at the Reykjavik Volcano House documenting the eruptions of Eyjafjallajökull and Fimmvörðuháls in 2010, which caused millions of people to be stranded worldwide as thousands of flights were cancelled. These films give a good insight into the general geology and volcanology of Iceland. At the Volcano House, you can experience a hands-on geological exhibition where you can examine various pieces of pumice, ash, and lava from Icelandic volcanoes. Later on, we depart from Reykjavik and drive to Thingvellir National Park, a UNESCO world heritage site, and where the Althingi, the oldest legislative assembly in the world was founded. This is one of Iceland’s most fascinating places both geologically and for the role it plays in the country’s history and sense of national identity. Thingvellir is also remarkable for reasons of natural science, as the site is part of a fissure zone running through Iceland, and is situated on the tectonic plate boundaries of the Mid-Atlantic Ridge. The faults and fissures of the area make evident the rifting of the earth’s crust. Included choice of activities: Snorkeling or river rafting or hiking or horseback riding or a visit to horse farm & geothermal greenhouse. A long drive brings us to a world of glaciers, ice, and icebergs. We travel to Jökulsárlón glacial lagoon filled with floating icebergs. We explore this extraordinary site and perhaps see some seals swimming in the Arctic waters. You can walk on the black sandy beach, the so-called Diamond beach, where large icebergs get stranded. The Vatnajökull National Park is about 12,000 square kilometres and it is the second largest National Park in Europe. In this area, we find Iceland’s highest mountains, an alpine environment, and Europe’s largest glacier. We will stay for one night in the Vatnajökull National Park region. Today, we head across the Laki lava field to the village of Vík where we make a photo stop. We take a stroll on the black lava beach and along the bird cliffs at Reynisfjara beach in South Iceland. We pass the glacier Mýrdalsjökull and the infamous volcano Eyjafjallajökull and continue to Skógafoss waterfall which is 62 meters high and belongs to the most impressive waterfalls in the country. Further west we reach the high but narrow Seljalandsfoss waterfall, which is 65 meters high and plunges over the mountain. In the evening you return to Reykjavik, where we stay two nights. Included choice of activities: Whale watching from Reykjavik or hike at Vatnajokull National Park or visit the Lava & volcano exhibition centre. Today we travel west. Borgarfjörður is known as the Saga Valley because of its many important historical events. We visit Deildartunguhver, Europe’s most powerful hot spring which produces 180 litres per second of water that is nearly boiling – 97° Celsius. Nearby, we visit a local family and their horse farm, where you will be able to hug an Icelandic horse or take a selfie with your new friend. The family members tell us about living and farming in rural Iceland. 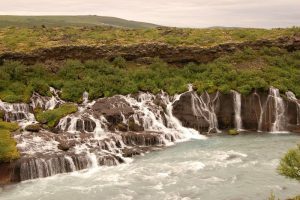 Hraunfossar is a series of waterfalls pouring from beneath a wide lava field. Barnafoss – the Children’s falls, is nearby with its own tragic tale. We travel back along the scenic shores of Hvalfjordur Fjord. Included activity: Monster-Truck tour on Langjökull glacier & visit to the world’s largest man-made glacier cave.